Isle Ewe is centred on NG 85046 88444 and lies within Loch Ewe just off the coast at Aultbea. 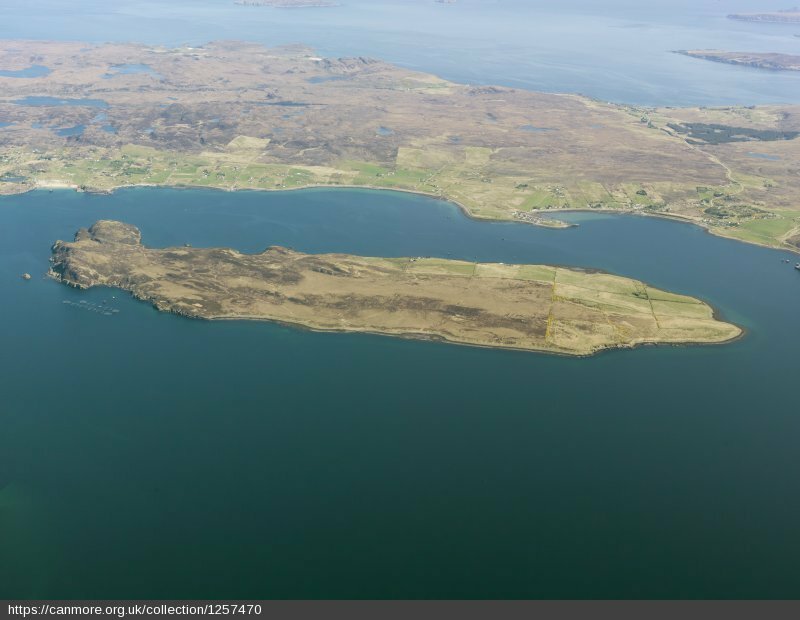 It was surveyed as part of an ongoing project to survey islands in the Gairloch parish area that have been inhabited. It is the largest of these islands comprising 764 acres and stretching roughly two miles from NW to SE. It is an island of two halves due to the geology. The NW consisting of Torridonian sandstone is higher, rockier with rough uncultivated grazing, whereas the SE consisting of deposited New Red sandstone has gentler contours with improved arable pasture. The SE is also sheltered from the prevailing NW winds. 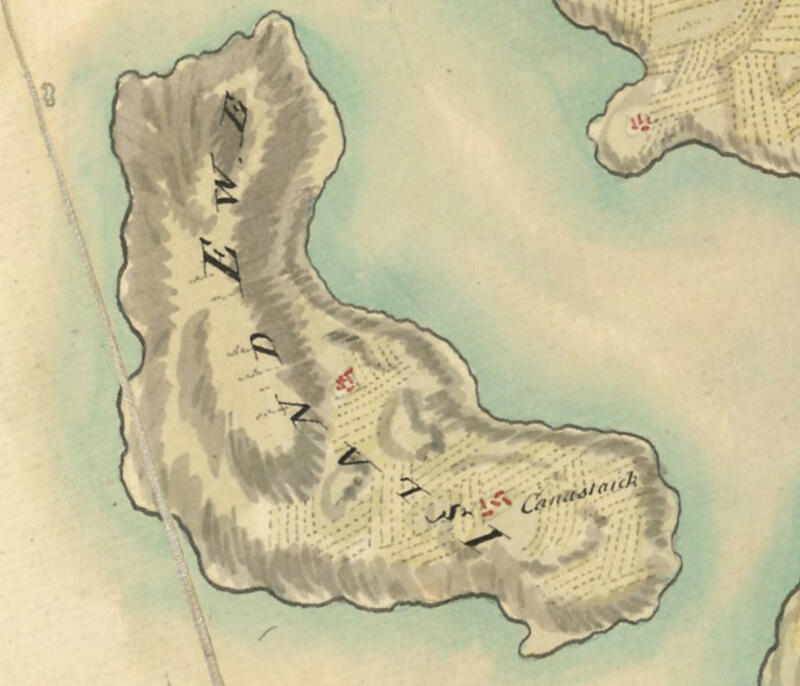 The earliest reference that I could find about the island was from 1583 when Nicolay refers to Loch Ew and the island. There are various references after this with differing spellings and Roy’s map of 1747 shows two settlements on the island. 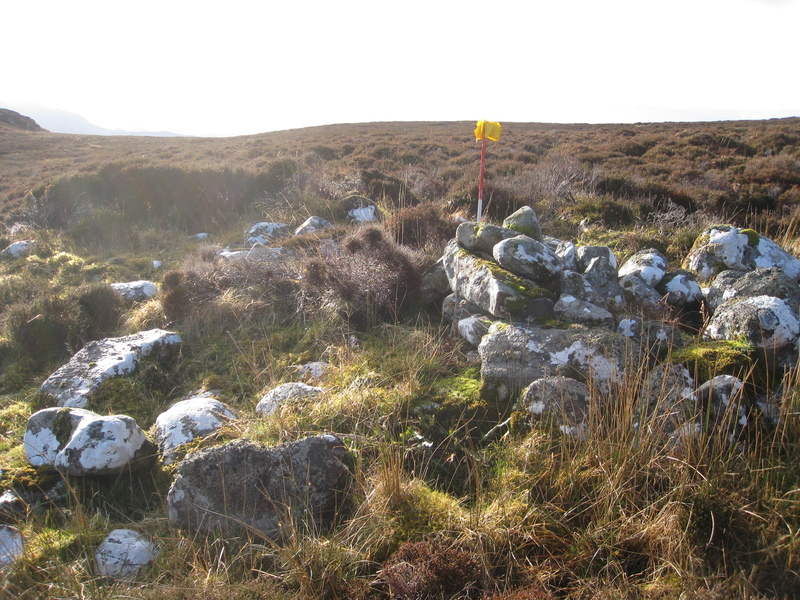 The island has been settled since the bronze/iron age as I found 5 roundhouses on the island and there could be more as the N end of the island is covered with rank heather overlying deep moss. At times it felt like I was swimming across the landscape, about to disappear never to be found. The island is still inhabited by the Grant family without whose help the survey would not have happened. The full report on the survey can be found on the NOSAS website under ‘past surveys and reports’ so rather than repeat everything I will highlight some of my favourite moments. The logistics of getting to the island involved constant communication with the Grants about the weather and once on the island a watchful eye was kept on the conditions. They picked me up from Aultbea and ferried me across to various landing points depending on where I was surveying which eventually took about ten trips. I find myself still going back as various queries crop up about more sites as they notice the island through different eyes. This entry was posted in 20th Century, Post Medieval, Surveying and Recording, Wester Ross and tagged archaeology highlands, archaeology Wester Ross, bronze age hut circles, Dr John MacKenzie, Grant family, Isle Ewe, Lathe and plaster, plane table, Post Medieval archaeology, Quarry for Aultbea church, recording and surveying, rig and furrow, Roy map, The Square, Threshing mill, Torr Loisgte, walkover survey, world war two archaeology on March 2, 2018 by nosas.